More mysterious abound in this masterful thriller! 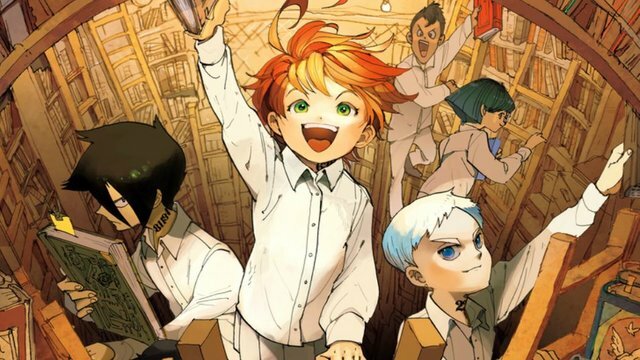 The first volume of Kaiu Shirai and Posuka Demizu’s The Promised Neverland was unlike anything else Weekly Shonen Jump had published prior, with its raw, heartbreaking spotlight on children planning a life-or-death escape from a human farm. With Shirai’s storytelling constantly shifting the stakes and Demizu channeling every bit of her creativity and heartbreaking into her artwork, it was the most unique debut for the shonen magazine in some time, and that thankfully remains the case for its second volume. As the young trio of Emma, Ray, and Norman strategize their breakout, they soon realize there are more hindrances to their escape than previously thought, with one revelation being harrowing it may split the three apart. In this volume, the game of cat-and-mouse also continues as the trio dodges the snooping ambitions of Mom’s new assistant: Sister Krone. Also in on Grace Field’s terrible secret, Krone is operating on her own objective to usurp Isabella as the new Mom, and with the knowledge there are kids who know the truth, she’s already begun probing the children while silently enduring the humiliation of obeying Mom’s orders. Be it engaging in high-speed games of tag or luring a friend of Emma’s for information, our unlucky heroes must juggle avoiding her grasp alongside the stress of another grim revelation: there is likely a traitor among the kids, someone who willingly gives information to Mom in exchange for not being shipped out. 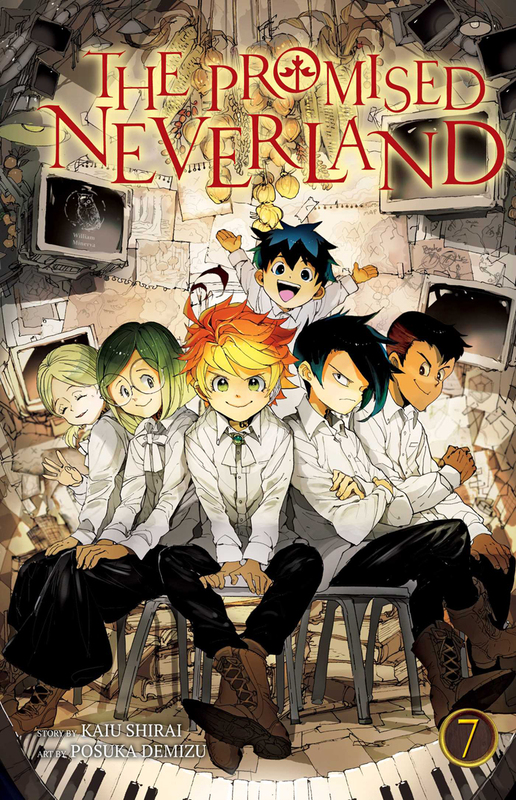 What we learn about The Promised Neverland in this volume is that it does not waste time. This twist is one that would’ve taken volumes to unmask in any other shonen, but with this being a suspense thriller, the series doesn’t have that luxury, so the traitor’s identity is unveiled only chapters later. We are introduced to possible suspects — more kids that Emma and co. decide to let in on the terrible secret — but even when a red herring is thrown into the mix, who it ends up being makes the most sense not just on character traits, but in what’s the most dire option for potentially fatal internal strife. How the kids approach the traitor dispels any notions of this mystery’s brevity being anti-climatic: said traitor is neither friend nor foe, and his cold-hearted condition for assistance (most of the kids must be left behind in their escape attempt) already plants the seeds for friction. 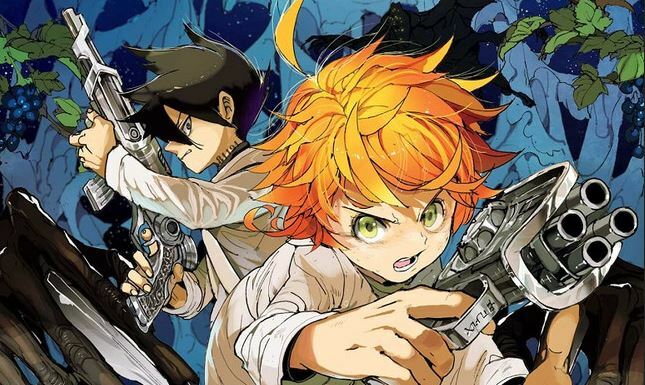 To contrast, where The Promised Neverland‘s first volume set up exposition and masterfully stacking twists upon twists, this iteration focuses on mystery-solving and cat-and-mouse play. With an unknown turncoat watching their every move alongside Isabella and Krone, the kids are forced to stay ahead of their pursuers even with the knowledge their plans are probably leaked to the enemy. As it reserves the rest of the mysteries towards the end, the traitor plot gets time to breathe and fulfill its duty without suffocating the plot, and so we never once feel un-engaged with its progression nor overwhelmed with too many details. Demizu’s art remains as inspired as ever, as we’re subjected to a whole new level of sinister thanks to Sister Krone’s devious expressions. Whereas Isabella is cold and calculating, Krone is far more active in her countenances, eyes growing white as she grins in mad giddiness whenever she closes in on her target. As she’s an African character, some have raised concerns of stereotyping thanks to her oversized lips, but she’s hardly a racist caricature in her actual motives and role. 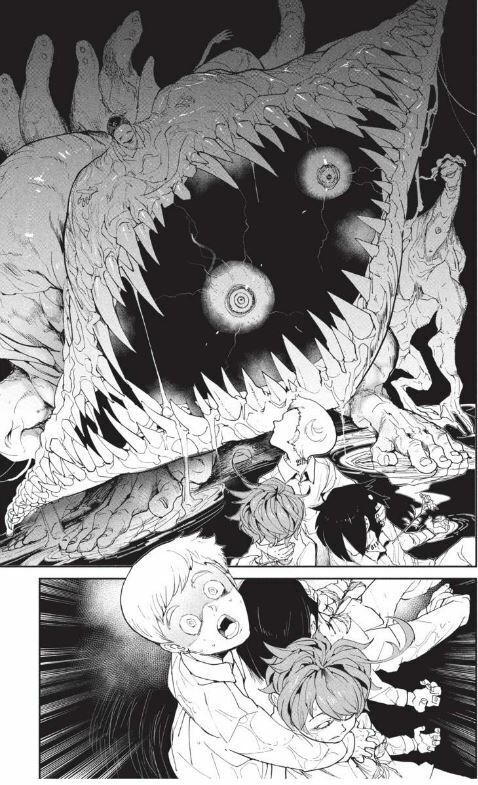 Any disappointments in the absence of demons are surely made up with Norman’s nightmare, where horrific fusions in the form of Isabella/Krone demons threaten to simultaneously embrace and devour him alongside the bodies of his fellow escapees in an all-encompassing panel. We also see the kind-hearted Emma put her foot down in her own brand of white-eyed terror, expressed with such chilling rage that I can’t help but feel we’ll see echoed later on down the road. Regardless, that we end on not one but two mysteries as well as a nail-biting cliffhanger already sets an unbearable wait for the third volume. This second volume may not be as shocking as the first, but the imagery and storytelling presented remain the most gripping Shonen Jump has to offer. Fans new and old don’t need reminders to hop on it, particularly when you can read four-panel stories of a more innocent time at Grace Field House. To think what may have been had it been like any ordinary orphanage…but alas, I cannot imagine that would make for a story this interesting.